Do you know what Anuptaphobia, Ablutophobia, Scopophobia or Nelophobia means? The NLA never ceases to surprise with its original and diverse range of publications. In this one the approach to phobias is highly entertaining and amusing. Some are repulsive, and others verge on the impossible or incredible. 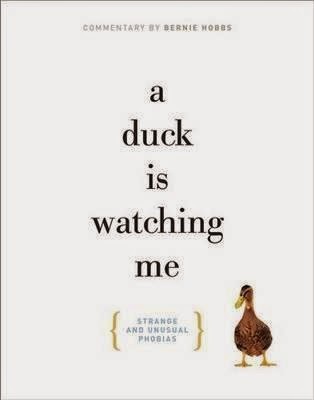 There is even a name given to a phobia for a duck that is watching someone. Details taken from fantastic photographs and posters, in black and white and colour, present a visual for each subject. (Full images can be found in the NLA online catalogue) The subjects range from phobias connected to animals, activities, nature, objects people, places, and the unbelievable. It is hard to allocate a readership for this unusual but fascinating book. The content will interest people of all ages especially children that love words or that want to impress others with unusual knowledge. It is a book to flick through or, a unique and collectable item for bibliophiles. The pictures paint a thousand words, and the commentary is priceless! It deserves a look and is definitely different and highly attractive. Suitable for readers aged 12+ years.